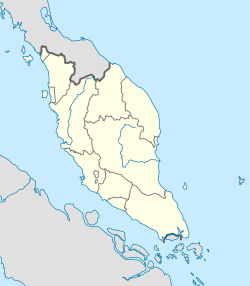 Shah Alam /ʃɑː ˈɑːləm/ is the state caipital o Selangor, Malaysie an situatit athin the Petaling Destrict an a smaw portion o the neebourin Klang Destrict. It is locatit aboot 25 kilometres (16 mi) wast o the kintra's caipital, Kuala Lumpur. Shah Alam replacit Kuala Lumpur as the caipital ceety o the state o Selangor in 1978 due tae Kuala Lumpur's incorporation intae a Federal Territory in 1974. Shah Alam wis the first planned ceety in Malaysie efter unthirldom frae Breetain in 1957. This page wis last eeditit on 11 Mairch 2018, at 11:37.